Nature's beauty reflected in an elegant Peacock feather design.This (4.3 cm, 1.7 in) sterling silver pendant brilliantly mimics the stunning colors and combinations of the peacock feather. Let its beauty enhance the beauty of the wearer. Includes a 16.5 inch silver necklace chain. The ancient technique of Millefiori using polymer clay has been used by the artists of Adina Plastelina to mimic the eyes of the peacock's feathers with all the brilliantly contrasting colors. Then they set it in a unique feather shape pendant with two spines on each side. 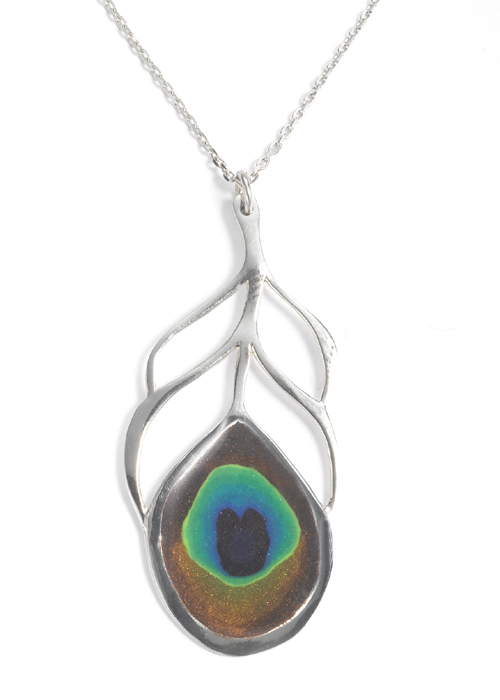 The pendant (4.3 cm, 1.7 in) is made of 925 sterling silver, hanging on a 16.5 inch sterling silver necklace. When you wear this pendant, no one will be able to ignore you!